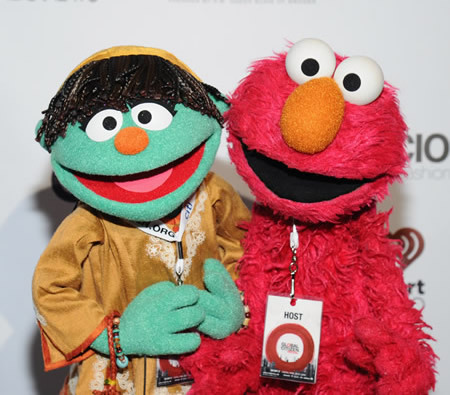 Photo: Sesame Street muppets Raya (L) and Elmo attend VIP Lounge at the 2014 Global Citizen Festival to end extreme poverty by 2030 in Central Park on September 27, 2014 in New York City. (Photo by Ilya S. Savenok/Getty Images for Global Citizen Festival. © 2014 Getty Images). 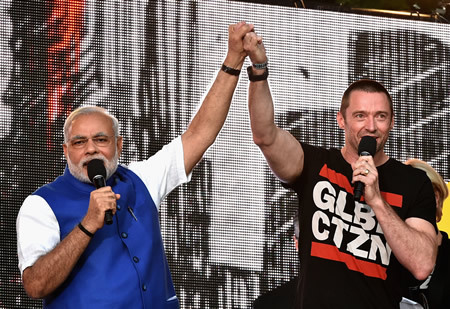 Photo: Prime Minister of India, Narendra Modi, and Hugh Jackman speak onstage at the 2014 Global Citizen Festival to end extreme poverty by 2030 in Central Park on September 27, 2014 in New York City. (Photo by Theo Wargo/Getty Images for Global Citizen Festival. © 2014 Getty Images). Photo: Adrian Grenier (L) and Prime Minister of Norway Erna Solberg attend VIP Lounge at the 2014 Global Citizen Festival to end extreme poverty by 2030 in Central Park on September 27, 2014 in New York City. (Photo by Ilya S. Savenok/Getty Images for Global Citizen Festival. © 2014 Getty Images). 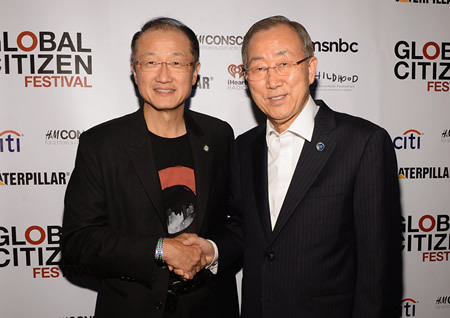 Photo: President of the World Bank, Jim Yong Kim (L) and UN Secretary General, Ban Ki-Moon attend the 2014 Global Citizen Festival to end extreme poverty by 2030 at Central Park on September 27, 2014 in New York City. (Photo by Ben Gabbe/Getty Images for Global Citizen Festival. © 2014 Getty Images). Photo: Katie Holmes (L) and Connie Britton speak onstage at the 2014 Global Citizen Festival to end extreme poverty by 2030 in Central Park on September 27, 2014 in New York City. (Photo by Theo Wargo/Getty Images for Global Citizen Festival. © 2014 Getty Images). 2014 Global Citizen Festival held In Central Park, New York City, on September 27, 2014 was a part of the Global Citizen movement to end extreme poverty. Musicians and celebrities joined dignitaries and philanthropists on the Great Lawn in Central Park to urge world leaders to make commitments in the issues of vaccines, education and sanitation. Rhythmic Gymnastics World Championships 2014 — Yana Kudryavtseva of Russia awarded the Longines Prize for Elegance. Photos: Yana Kudryavtseva (Russia), winner of the 2014 Longines Prize for Elegance at the 33rd Rhythmic Gymnastics World Championships in Izmir, Turkey. Yana Kudryavtseva of Russia clinched the World Championships all-around title at Rhythmic Gymnastics World Championships 2014 in Izmir, Turkey, on Friday, September 26, 2014. Yana Kudryavtseva was also awarded the Longines Prize for Elegance. The gymnasts under consideration for this prize are evaluated according to a number of complementary criteria. In addition to technical considerations, each athlete’s performance is judged with respect to emotional appeal, beauty, charm as well as grace and harmony of movement. 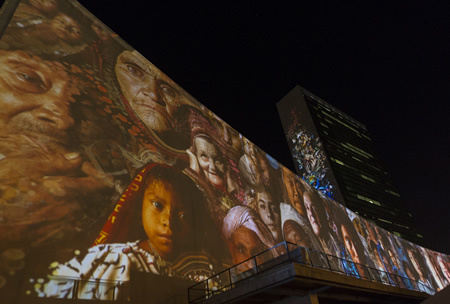 Photo: A view from the street of the 30-story architectural show, “illUmiNations: PROTECTING OUR PLANET”, being projected on to the side of the UN Secretariat building in New York. The special audio-visual presentation, organised in partnership with the Oceanic Preservation Society and Obscura Digital to inspire global citizens to take climate action, is part of the lead-up to the Climate Summit, taking place on Tuesday, September 23, 2014, at UN Headquarters. UN Photo/Mark Garten. 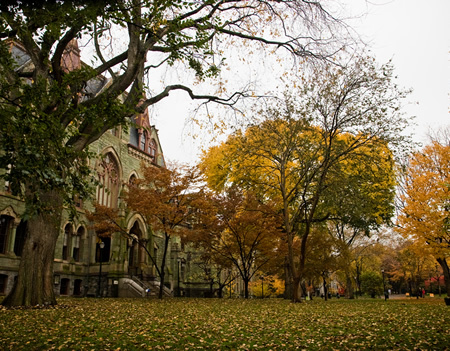 Photo: University of Pennsylvania in the fall. Photo Credit: Saikofish Lou. The global emphasis on high-impact scientific and technological research is the key driver of leadership in the QS World University Rankings 2014 announced today in London. MIT leads for the third year and increased its year-on-year citations per faculty by 14%. Imperial College also reported a 14% increase in this metric compared to 11% by Cambridge and 2% by Harvard. The average increase amongst the top 10 was 7%. Caltech remains the world’s top university for research citations. All the top ten institutions achieve excellence in academic reputation, employer reputation, student faculty ratio or measures of international faculty and students. The performance of Imperial College in citations per faculty has helped it become the biggest climber in the top 10, leapfrogging Harvard, UCL and Oxford to rank second equal in the world, tied with University of Cambridge. 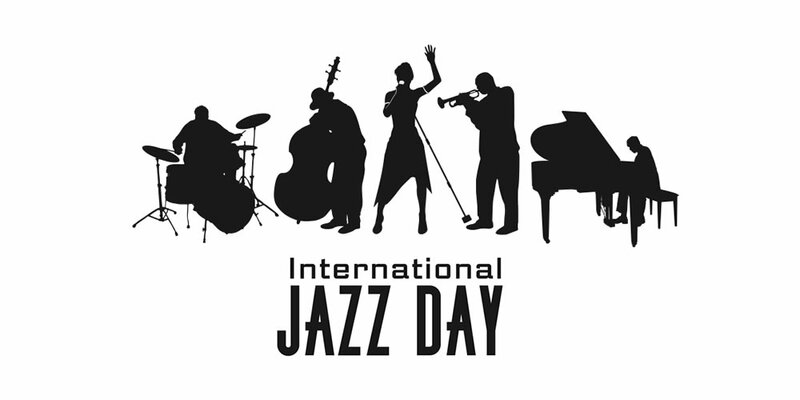 31 countries are represented in the top 200; The US is the dominant nation, with 51 institutions, ahead of the UK (29), Germany (13), The Netherlands (11), Canada (10), Japan (10) and Australia (8). Photos: CND Spring/Summer 2015 at The Metropolitan Opera House and Milk Studios on September 7 & 10, 2014 in New York City. 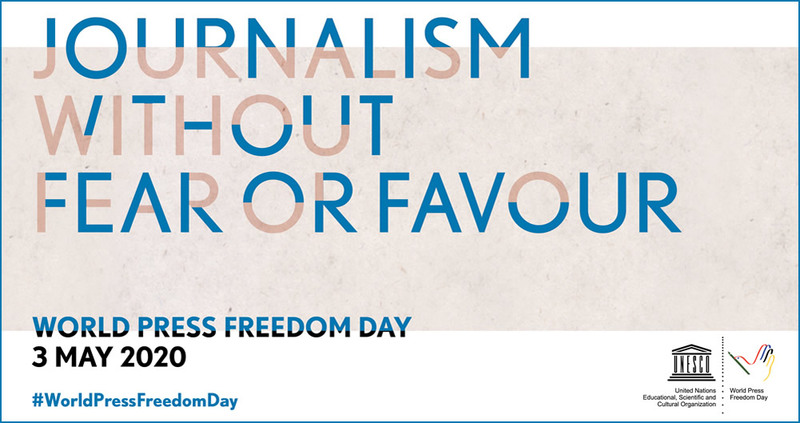 (Photos by Jennifer Graylock/Getty Images for CND. © 2014 Getty Images). CND (Creative Nail Design, Inc.), a global leader in professional nail care, showcased dreamy nail designs at a Spring/Summer 2015 Fashion Show at the Metropolitan Opera House in New York City. CND is based in Vista, CA, USA. The nails presented at the show were a collaborative effort between the elite artists of the CND Design Lab Team and celebrity nail artist Naomi Yasuda.